This is the power of AWR-360, as we are rebranding Adventist World Radio. Change was in the air in 1989. The Cold War ended. The Berlin Wall came down. Romania’s communist government was overthrown. Ilie and his wife, Lydia, felt free for the first time in their lives. Ilie embarked on a search for answers about God and the state of the dead, questions that had been burning in his heart for years. He obtained his first Bible and began to attend an evangelical church in Pitesti, a city of about 165,000 people located 75 miles (120 kilometers) west of Romania’s capital, Bucharest. After a few years, Ilie and Lydia discovered to their surprise that Jesus had been baptized by immersion in the Jordan River. Ilie immediately asked his church family to baptize him like Jesus. He was told that he had been sprinkled as a baby and that was enough. Devastated, Ilie intensified his reading of the Bible. He befriended Christians from another evangelical denomination who gladly baptized him and his wife by immersion. Ilie threw himself into his new-found faith. He even led construction of a new church building and became one of the church’s evangelists. But Ilie’s Bible studies weren’t finished. Four years ago, Ilie was working for the railroad, switching tracks as trains rolled through a railroad yard, when he noticed that a coworker listened to the radio from a cellphone app. Ilie decided to do the same and quickly became engrossed with programs about prophecy and end-time events on Adventist World Radio (AWR). He read his Bible like never before and discovered to his shock that he was worshipping on the wrong day of the week. He told his Christian friends about what he had found and showed them texts in the Bible. But they grew angry and refused to listen. Ilie told me that he was puzzled about what to do next. He had never met a Seventh-day Adventist and thought that he was alone in his search for a church that observed the biblical, seventh-day Sabbath. He searched and searched and finally found an Adventist church not far from his home. He visited the Pitesti Seventh-day Adventist Church for the first time in 2015. Lydia cried and cried. She loved her friends at their Sunday church and refused to go with her husband. But Ilie refused to relent, and he worshipped at the Adventist church with their two teenage daughters every Sabbath. “Ask me anything you want,” Ilie said. “Ilie knew it all!” the pastor told me. After a few weeks, Lydia agreed to study the Bible with her husband. Soon she grew excited about what they were discovering together. Actually the information echoed what Ilie had been sharing with her as he listened to AWR at work for the past two years. After a while, Ilie, Lydia, and their eldest daughter were baptized. The younger daughter kept attending church with them but struggled over baptism. 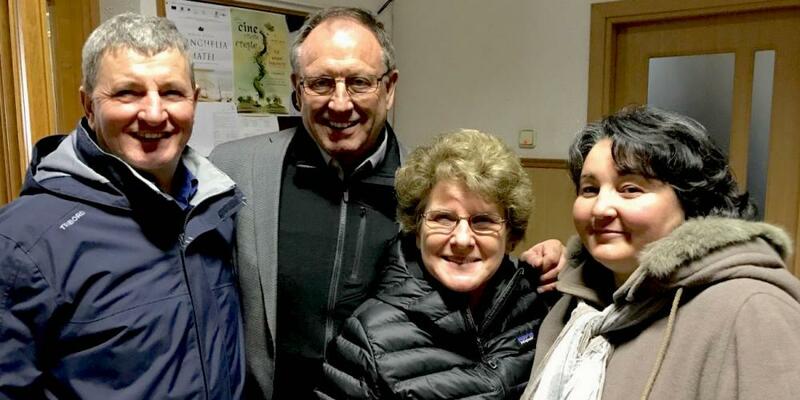 However, she accepted the Advent message during evangelistic meetings at the Pitesti church, one of hundreds of sites where Total Member Involvement evangelistic meetings were held across Romania in February 2017. She was baptized just a few days ago. This is the power of AWR-360, as we are rebranding Adventist World Radio. AWR-360 is not just about radio broadcasts. It’s about the entire cycle — “from broadcast to baptism.” Ilie’s story, like the stories of many listeners of AWR’s broadcasts and podcasts, follows this same cycle from broadcast to baptism. Today, Ilie loves AWR and encourages others to listen to its programs, which are aired daily on buses, in taxis, and in many stores in Pitesti and other Romanian cities, including Bucharest. Ten to 15 people visit the Pitesti church every week after hearing about the Sabbath or Jesus on AWR, Pastor Baluta said. Seeing Ilie’s enthusiasm for AWR, my wife, Kathy, asked Lydia how actively her husband promotes AWR to the townspeople of Pitesti. Lydia rolled her eyes and smiled. “He can’t keep his mouth shut,” she said. March 4 - Elephant Attack In rural Myanmar, wild elephant attacks are no joke! Watch to see how a Global Mission pioneer and his village stayed safe in the midst of an angry attack.